First, we want to express what a privilege it is to serve such a wonderful body! Every week, we see firsthand the ways in which God is doing great work in and through this body in Central Texas and beyond. It is an honor to serve you and alongside you! Second, as so much change has occurred over the last five years, we thought it fitting to communicate a few important items. 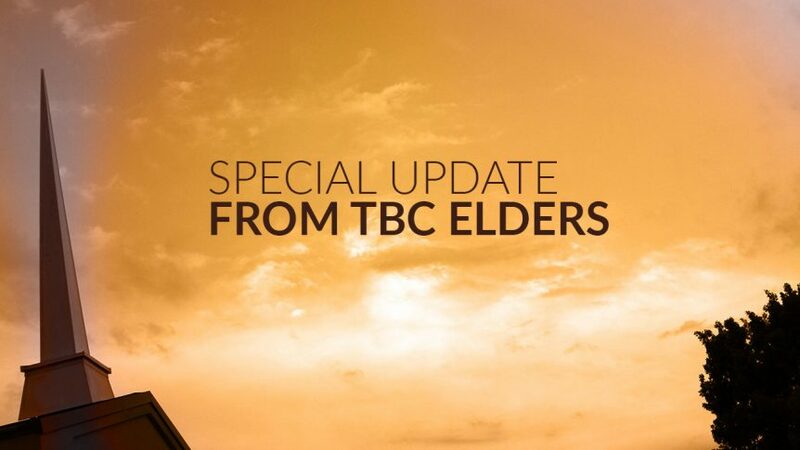 Who are the elders and what is their role at TBC? Over the last couple of weeks, you’ve heard decisions made by “the elders,” and it may be helpful to understand their purpose and function. What type of staff leadership model do we have at TBC? Over the last fifteen years, we’ve moved to a plurality of leadership, and we would like to explain what that means. What does Gary’s transition mean for TBC? In January, we announced Chase Bowers as the next lead teaching pastor, and it may be helpful to clarify what that means. What can we expect next? Chase’s changing area of focus is not the only move we’re going to need going forward, so we want to prepare everyone for what’s coming next. In accordance with the Scriptures and designated in our constitution, TBC is not directed by an ecclesiastical body (i.e. a denomination); rather the church is governed by a group of local under-shepherds (“elders”), each looking and submitting themselves to Jesus Christ as the Head and Chief Shepherd. The elders are tasked with spiritual leadership and governance of the body. Meeting every three weeks for prayer and discussion, a unanimous vote is required for action, at which time the decision is finalized. While we do not have congregational votes, the elders do seek congregational input. The duty and responsibility of the elders is to remain sensitive to the needs of the flock-at-large. When Gary DeSalvo accepted the position of Pastor 38 years ago, the church body and staff was much smaller than they are today. There was an existing elder board that provided oversight of the church; but, for many years, the staff was primarily led by Gary. Danny fulfilling executive functions and pastoral staff oversight (along with many other roles). Over the last five years, we’ve seen even more clearly how Gary and Danny effectively and lovingly lead our pastoral team together with a spirit of unity. As our body continues to grow, we plan to expand the staff leadership team to at least three people. Even prior to news about Gary’s cancer (ocular melanoma) five years ago, Gary and the elder board began to plan for his eventual retirement. Purposefully, we began to invest in our younger pastoral staff, preparing them for increased leadership and responsibility. God’s church is to always be about preparing and equipping men and women to use their God-given gifts to their fullest, to the benefit of the entire body. At that time, we moved away from a single voice in the pulpit and instituted a teaching team. This has been an obvious blessing to our body as we hear God’s Word taught through the lens of different, godly men; and it has also been refreshing and revitalizing to Gary. It has accelerated the maturation and teaching ability of many of our pastors. As we continue to support and love on Gary, Bev, and their family during this time, we have continued to discuss transition plans. First, we are savoring the time we have with Gary; we pray for healing and continued ministry opportunities for Gary as long as God wills, but most of all we desire that God be glorified whether in healing or in bearing this burden in a godly, faithful way as he has shown us. Second, we are not trying to replace Gary. He does far too much to replace with a single person. His abilities and ministry opportunities have been forged over nearly four decades of faithful service. Third, the elder board’s unanimous decision is to make the first of many transitions that we’ll need to make as a body going forward, namely designating Chase Bowers as the next lead teaching pastor. Chase Bowers is not expected to replace Gary DeSalvo. As stated earlier, Gary does far too much to be replaced with a single person. The elder board continues to explore how to effectively ensure that our church leadership covers all the work that Gary does today, but you can anticipate that the long-term solution will be a combined effort from various pastors, along with service by elders, staff, deacons, as well as the congregation. Chase’s new role is specifically lead teaching pastor. As TBC elders, we felt it vitally important to start this transition with addressing the teaching of the Word. The word “Bible” is in our name, it’s in our very DNA, and it’s the fundamental tenant of who we are as a church (Acts 6:1-6, II Tim 4:2-4, II Tim 3:16-17). Chase’s role will be to lead the teaching team as they plan and deliver the Sunday morning sermons. He will lead our team in a vision for the entire body that ensures the gospel is taught with truth and grace. How does that impact our staff leadership? Chase will join Gary and Danny in our plural leadership model. With Chase in his new role, there are additional decisions that we need to make. For example, we will need to replace Chase’s role as our Global Outreach Pastor. Thankfully, we have a remarkably talented team at TBC, specifically in our pastoral and support staff. We recognize their love for the Lord, their immense gifts and talents, and we are confident that God has and is preparing TBC leadership for many years to come. We are grateful to God for the amazing team we have here at TBC. As transitions happen, other staff members may take on new, expanded, or different roles, and eventually new pastors will be brought in as needed. Please pray for us as we seek the Holy Spirit’s guidance on all of these decisions. If you have any questions or concerns, the elders are available to discuss these issues more.